Surfers ear ( otherwise known as "exostoses") is a condition where the ear canal is narrowed by bone which grows slowly in the ear canal over a long period of time. The bone grows in lumps, which form bulges, behind which water may be trapped. The new bone growth is stimulated by exposure to cold water and cold air. 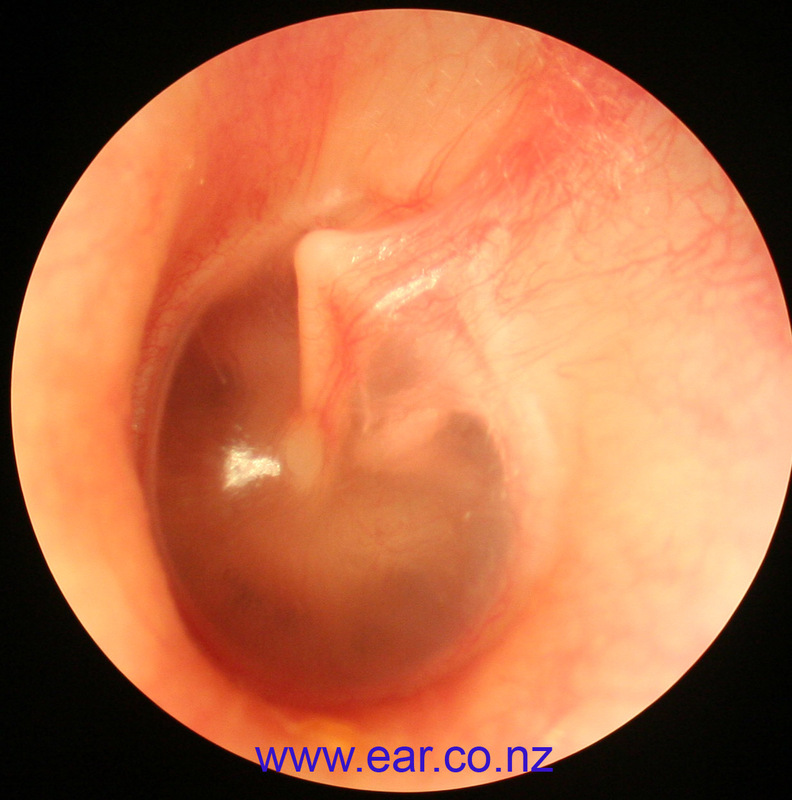 Surfers ear is therefore common in New Zealand, the West Coast of the U.S. and the Coast of Australia. Given enough time and enough cold exposure, the bony lumps (known as exostoses) may eventually completely close the ear canal off. Ear canal infections - these may become increasingly common as the exostoses grow. Ususally they follow water exposure through swimming. The narrowness of the ear canals may make these infections slow to settle. The infections are treated with antibiotic ear drops and sometimes oral antibiotics. Some exostoses do not require any treatment, but once these have been diagnosed it may be wise to protect the ears from cold water exposure using ear plugs (such as 'Surf Ears' or 'Docs Pro plugs' and/or a neoprene headband or hood. This may slow down the growth of the exostoses. Water blockage may often be successfully managed using "Vosol" ear drops after swimming other water exposure. These displace moisture and help dry and acidify the ear canal, reducing the risk of ear canal infection. If the exostoses are causing persisting problems with ear water blockage or ear infections they are best removed. This is performed under a general anaesthetic (you are asleep). It is often done on a "day stay" basis, or with one overnight stay at Gillies Hospital.A cosmetic incision is made to hide it in the crease behind the ear, and the skin is carefully protected prior to removing the exostoses with a tiny drill and/ or chisel. In my experience, this is the best and safest way to do the operation, and has the lowest risk of repeat surgery being required in the future. Antibiotic coated dressings are left in position in the ear canal for 3 weeks, then replaced for another two weeks, following which ointment only is applied. Altogether, it takes 7-12 weeks for the ear canal to copletely heal.The ear must be kept dry during this time. The skin incision is closed with dissolving stitches and protected with a thin layer of skin glue. A bandage is worn for the first night only. Hearing tests are performed pre operatively and at 10-12 weeks post operatively. I commonly will do both ears, spaced a week apart, and in this situation a hearing test is done before the second op. There is only modest discomfort following the surgery for exostoses-- which is usually easily managed with paracetamol and an anti- inflammatory. These are usually taken for a week post op. I advise avoiding heavy lifting or straining for two weeks afterwards, which may mean "off work" and "no gym" for some people. Plenty of walking for light exercise is fine. In my experience, this operation only needs to be done once in a lifetime. Here are some examples of ears which have been widened. General Anaesthesia- In general, most people having this operation are fit, active and well. For those with no other medical conditions, the risk of a life threatening consequence is less than the risk of driving to the clinic, and less than the risk of flying- something most people will do without a second thought. All patients are assessed and advised pre operatively by a specialist anaesthetist. Scarring- this may very rarely occur behind the ear or in the ear canal. Hearing loss. In any ear operation there is a risk of approximately 1% of this occurring, due to drilling noise or other factors. This may be measurable on a hearing test, but is not necessarily always detectable by the consumer. Since 1997 when I first started operating in private practice, I have not had a case where a patient mentioned hearing loss after ear canal healing. Tinnitus (ringing in the ear). This is quite common (but rarely troublesome) in the few weeks post operatively while the ear canal dressings are in place, but almost always resolves when they are finally removed. Facial nerve injury. I have never seen this occur, but it has been described in otolaryngology journals. No need for ear plugs! The information on this website is for general guidance only. For specific advice relating to your exostoses, please call 631 1965 to make an appointment.